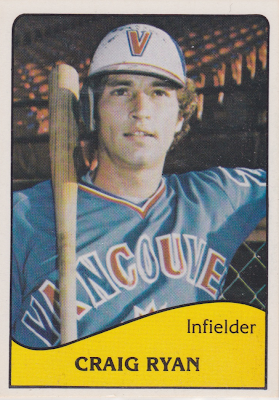 Ryan split time between 1B and OF in 1979 and led Vancouver in homers that year with 16. He hit even better (.841 OPS) in 1980, but never got a call to Milwaukee. It was impossible to crack the Brewers lineup at those positions, thanks to these guys (team stats). Add future HOFers Robin Yount and Paul Molitor to that lineup and you're scoring runs on a regular basis. Lezcano's 1979 season is one of the least-recognized great years, as he's one of just 19 players to break 160 OPS+ in the first DH decade (1973-83). Sixto also picked up a Gold Glove and finished 11th in WAR--a tick behind Paul Molitor--yet Gorman Thomas still got more MVP votes, thanks to those 45 homers. That "did not play" comment's misleading, as Craig was a pro in Mexico for all of 1977 and 1978. He moved on to Japan in 1981 and finished there at age 28 (career stats). Vancouver's checklist includes 25 players and staff, with two sharing #22 and #23, thanks to call-up replacements. Guys with MLB experience in bold. Why was Kent Biggerstaff a trainer and not a player? Then managers could say, "that shortstop hits like he's holding a broom handle--put in Biggerstaff!" Value: Craig cost $2 from MinorLeagueSingles.com. Ned Yost is the best known roster-mate, thanks to his managing career. Few will cost more than a dollar or two. Fakes / reprints: Haven't seen any in the marketplace. 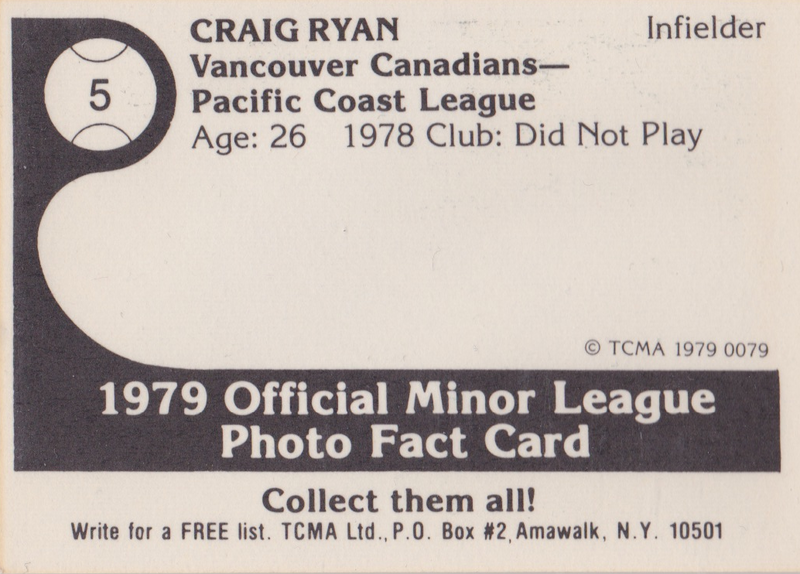 TCMA reprinted many 1980 team sets for "collectors kits" later in the 1980s, but not sure if 1979 players also showed up there. I would love to be able to tell my Dad I found the guy that wrote the article. This is so cool! That's very cool, will get in touch!